On Wednesday June 6th, the State Office of Administrative Hearings (SOAH) Administrative Law Judge (ALJ) issued a ruling dismissing TESPA's Motion for Summary Disposition in the Needmore Water LLC Contested Case, granting Needmore and BSEACD's Motions and cancelling the Hearing on the Merits, which was scheduled for July 19th. The result of this decision is that Needmore's application will now at some point in the near future go before the BSEACD Board of Directors for final approval. 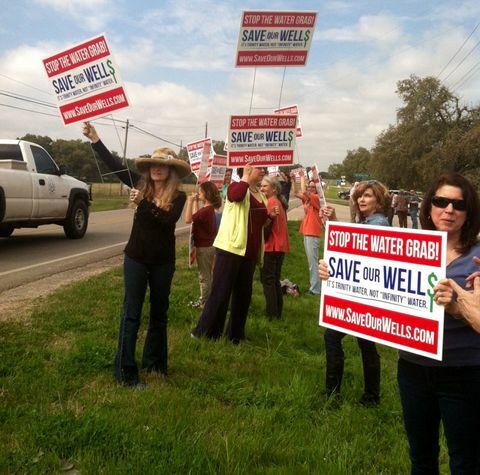 This is a huge legal set back that means Needmore is now one step closer to gaining approval to pump 289,000,000 a year from the already taxed Trinity Aquifer. 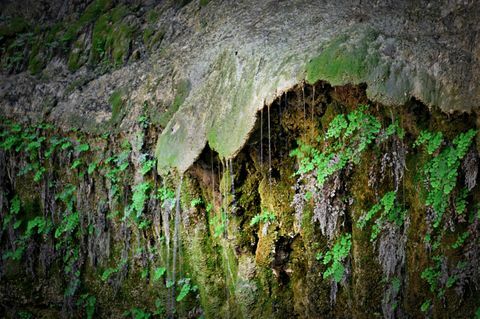 Today, the SOAH administrative law judge granted the Trinity Edwards Springs Protection Association standing to contest Needmore Water, LLC's proposed permit before the Barton Springs Edwards Aquifer Conservation District. Many landowner members of TESPA near Needmore Ranch testified about their concern regarding Needmore's proposed permit and plan to pump over 289,000,000 gallons a year from the Trinity Aquifer. TESPA's hydrogeologist, Doug Wierman, testified that the proposed permit will potentially impact existing wells. The regular hearing on the merits has been tentatively scheduled for March 5-8, 2018. The parties will discuss setting a schedule for discovery. Today's ruling is significant because TESPA now has the opportunity to challenge Needmore's permit. However, this means that TESPA needs to raise money to pay for all of the costs associated with the four day hearing, including attorney and expert witness fees, technical studies, and SOAH court costs. Tomorrow morning (July 31) TESPA's preliminary hearing on standing will take place at the State Office of Administrative Hearings. To be able to contest BSEACD's issuance of a proposed permit to Needmore Ranch, TESPA must prove that it and its members have standing--that there is a potential that members of TESPA will be injured if the permit is granted. This is the first step in the process that allows TESPA to challenge the proposed permit. Needmore applied for a groundwater permit for over 289,000,000 gallons a year from the Trinity Aquifer. BSEACD granted the permit with special conditions and TESPA filed a contested case request. For more information, click here. The public is welcome to attend this hearing, and we encourage you to do so. The hearing will take place at 10:00 AM at SOAH's main office, 300 W. 15th Street Suite 504, Austin, Texas 78701, on the 4th floor of the William P. Clements Building. Today, the SOAH Judge denied Needmore's Plea to the Jurisdiction, ruling that House Bill 3405 permits third parties, such as TESPA, from contesting permits. Consequently, TESPA can move forward with a hearing on standing. Unfortunately, House Bill 4122 is moving. It will be heard on the House Floor tomorrow, Friday May 5th. As we wrote in a previous post, the committee substitute is slightly less worrisome in that it would allow HTGCD and BSEACD to refuse to transfer territory, but there are too many avenues for the bill to be amended and for the law to be manipulated. 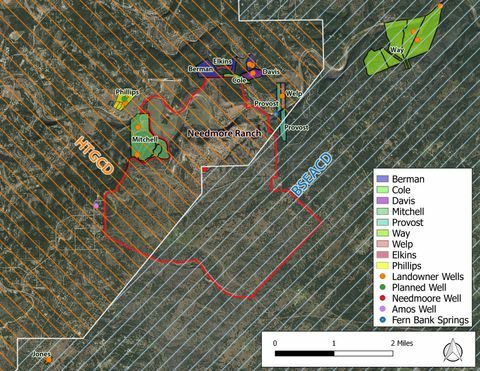 - It caters to a special interest, Needmore Ranch, at the expense of smaller landowners, allowing the ranch to circumvent BSEACD's jurisdiction and a proposed permit the district has issued which Needmore Ranch has publicly opposed. - It unravels House Bill 3405, passed last session, which extended BSEACD's boundaries to protect existing wells. Thanks to the Austin American Statesman and Asher Price for writing about the Needmore Ranch legislation. .
Three bills have been filed: Senate Bill 1814 (Companion, House Bill 4122), House Bill 4045, and Senate Bill 2254, which would result in less regulation over groundwater production from Needmore Ranch. TESPA opposes both of these bills and has prepared this analysis. This bill gives Needmore Ranch MUD groundwater conservation district powers under Chapter 36 of the Water Code. If the district’s creation is confirmed at an election, the territory of Needmore Ranch is removed from BSEACD and HTGCD. 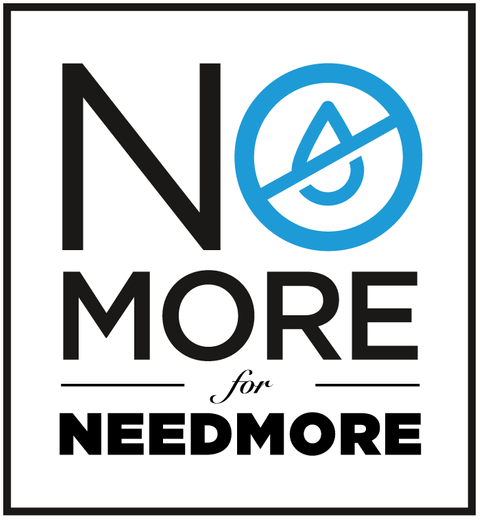 Needmore Water LLC has applied to the Barton Springs Edwards Aquifer Conservation District (BSEACD) for a groundwater permit that would allow them to pump over 289,000,000 million gallons of groundwater a year from the Trinity Aquifer or 550 gallons per minute per day. This is an excessive and greedy request. This amount would cover the 5,000 acre ranch in 2 inches of water and is enough water for over 39,000 head of cattle at 20 gallons per day per head. Aquifer tests revealed that pumping at this rate caused over 14 feet of drawdown in a monitoring well almost two miles away. BSEACD projects that within seven years, drawdown could be as much as 140 feet. This volume of pumping coupled with other large groundwater development projects planned for the Trinity Aquifer (like EP), could have devastating impacts to aquifer levels and could impact spring flow and flow in the Blanco River. This afternoon, pursuant to the briefing schedule agreed to by all Parties, Needmore filed a Plea to the Jurisdiction and Brief on Hearings and Parties, with SOAH, arguing that House Bill 3405 prohibits third parties from contesting permits and that therefore, SOAH does not have jurisdiction to hear the case. TESPA will submit its response brief in two weeks. Click here to read the brief. 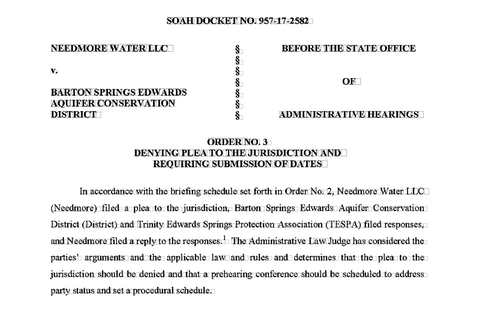 TESPA's request for a hearing on Needmore Water LLC's Regular Permit application before BSEACD has been referred to the State Office of Administrative Hearings and an Administrative Law Judge has been assigned to the case. For your reference, the SOAH docket number is 957-17-2582. 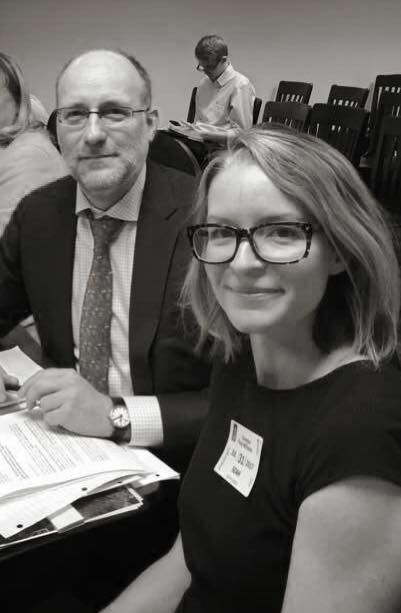 On March 6, the ALJ held a prehearing phone conference with Needmore's attorney, Edmond McCarthy, BSEACD's attorney, Bill Dugat, and TESPA's attorneys, Vanessa Puig-Williams, Jeff Mundy, and Charles Irvine. The parties agreed to a briefing schedule to submit written arguments between now and the end of April. The ALJ will be issuing an order with specific deadlines. The preliminary hearing on standing will likely take place sometime in May, although the date has not been set. TESPA will send an update out with this date. TESPA needs your help to fund the legal expenses associated with challenging this permit. We cannot do it without adequate financial resources. Individual donations are instrumental in funding this fight! Today, TESPA sent BSEACD a letter in response to Needmore's argument that House Bill 3405 prohibits contested case hearings. Needmore's argument would deprive affected landowners of their ability to protect their property rights. BSEACD will consider Needmore's argument at their Board meeting tomorrow night (January 12th, 6:00 PM). Please attend and voice your opposition to Needmore's request that the Board prohibit TESPA from protesting! On December 19th, TESPA filed a contested case request with BSEACD protesting the District's proposed decision to issue a groundwater production permit to Needmore Water, LLC in the amount of 289,080,000 gallons a year. Needmore's attorney, Ed McCarthy also sent the District a letter expressing opposition to the District's decision to require Needmore to reduce pumping if there are impacts to nearby wells. You can read the letter here. One of Needmore's arguments is that under the law that extended BSEACD's jurisdiction to cover Needmore Ranch, Needmore should be entitled to pump the "maximum production capacity" of the well without any conditions requiring them to reduce pumping. In a 12/19 letter to BSEACD, Needmore's attorney, Ed McCarthy, argues, among other things, that House Bill 3405 prohibits affected landowners from protesting Needmore's application to produce over 887 acre feet of groundwater a year from the Trinity Aquifer. For several reasons, TESPA disagrees with this argument and sent a letter to BSEACD explaining why Mr. McCarthy's argument is flawed. The Austin American Statesman reports that State Representative Isaac is committed to fighting legislation that would provide special protections to Needmore Ranch and undermine House Bill 3405. "LaMantia has asked to pump water at a rate of 550 gallons per minute — enough water to fill an Olympic-size swimming pool every 20 hours." It is excellent news that Representative Isaac is fighting to stop one landowner from plundering a resource that other people own and all of us need. We need to band together and stop these bills, but we also need to band together and take action to change groundwater laws in this state--laws which are designed to protect a landowner's right to produce groundwater rather than conserve it.